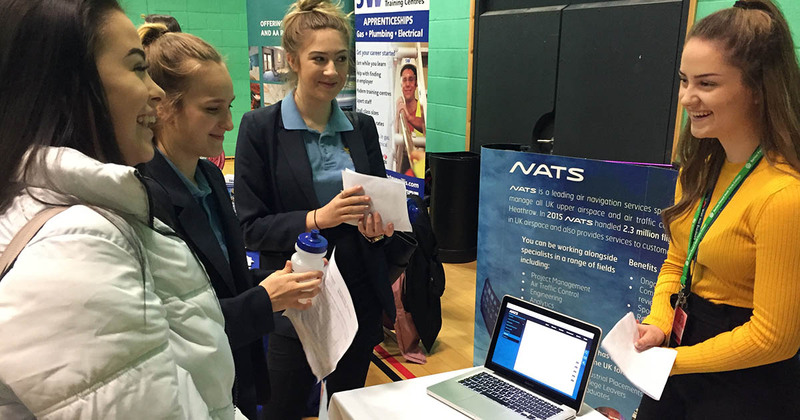 Wyevrn College pupils Libby, Olivia and Carla talking to Hayley Freeman from NATS. Barton Peveril welcomed over 50 local employers, Apprenticeship providers and Gap Year Organisations to its annual Futures Fair. Barton Peveril students attended to find out about all their options after college, whilst pupils from Wildern School, Thornden School, Wyvern College and Brookfield Community School were also invited to start thinking about their futures. Representatives from some of the nation’s largest employers attended the Futures Fair, including IBM, ExxonMobil, NATS and the RAF. Barton Peveril alumni were also present and representing their current employers, whom they first met at last year’s Futures Fair. The Futures Fair followed the Higher Education Fair, were representatives from Universities around the country attended to discuss all aspects of University life with current students.